Today we celebrate the feast of the Baptism of our Lord. This feast day brings the Christmas season to a close. When you come back to church next week, all of the Christmas trees, decorations and poinsettias will be gone. We will return to the liturgical ordinary time of the year. What a beautiful way though to end the Christmas season by recalling the baptism of Christ in the Jordan River. We hear in today’s gospel that John the Baptist proclaims that one mightier than he is coming. Everyone thought that John was the messiah, when he adamantly says to the people it is not I, but Jesus. As Jesus is baptized, the heavens open and the Holy Spirit descends upon him as the voice of God proclaims, “This is my beloved Son, with whom I am well pleased”. Baptisms are moments of great joy and grace. We are given the gift of the Holy Spirit on the day of our own Baptism. By water and the Holy Spirit, we are reborn in Christ Jesus. In a very real sense, we are a new creation in Jesus Christ. As we celebrate the Baptism of the Lord, we recall the promises made at our own Baptism, to profess our faith in Jesus and his most holy Catholic Church. May we continue to be filled with the Holy Spirit, as we preach and teach in the name of Christ our Savior and King. Each year, the Vicariate for Black Catholic Concerns sponsors a prayer service commemorating the birthday of Dr. Martin Luther King Jr. 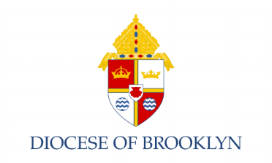 This year, that prayer service will take place on Monday, January 21, 2019 at Our Lady of Lourdes Church located in Queens Village. There will be a bus leaving from St. Gregory the Great Church in Crown Heights that day. The cost per person for the bus will be $10. The homilist will be Father Peter Damian Harris, O.P. He is a Dominican priest located in the Archdiocese of Galveston-Houston in Texas. There will be a reception following the prayer service. Our parish choir will provide the music for this Diocesan celebration. All are invited. During the month of February, we commemorate Black History Month. We give thanks and praise to God for the gifts and talents of African-Americans throughout the world and within our Church. We also recall our ancestors who have gone before us marked with the sign of faith. Here at St. Martin de Porres, we will have a number of activities planned for Black History month. We will continue to custom of showing a film on Saturday evenings at St. Peter Claver following the 5:00PM Mass. Each film depicts a theme related to Black History. Our Mass of Thanksgiving for Black History Month will take place on Sunday, February 10 at Holy Rosary Church beginning at 12:00Noon. We will welcome Father Anthony Bozeman, SSJ as the celebrant and homilist. There is a flyer in this week’s bulletin for more information.